The United States was the 2nd largest energy consumer in 2010 (after China) considering total use. The U.S. ranks seventh in energy consumption per-capita after Canada and a number of small nations. Not included is the significant amount of energy used overseas in the production of retail and industrial goods consumed in the U.S. In June 2010, the American Energy Innovation Council, a group which includes Bill Gates, founder of Microsoft; Jeffrey R. Immelt, chief executive of General Electric; and John Doerr, has urged the government to more than triple spending on energy research and development, to $16 billion a year. Mr. Gates endorsed the administration's goal of reducing greenhouse gas emissions by 80 percent by 2050, but said that was not possible with today's technology or politicism. He said that the only way to find such disruptive new technology was to pour large sums of money at the problem. The group notes that the federal government spends less than $5 billion a year on energy research and development, not counting one-time stimulus projects. About $30 billion is spent annually on health research and more than $80 billion on military R.& D. They advocate a jump in spending on basic energy research. Primary energy use in the United States was 25,155 TWh or about 81,800 kWh per person in 2009. Primary energy use was 1,100 TWh less in the US than in China in 2009. Same year the share of energy import in the US was 26% of the primary energy use. The energy import declined ca 22% and the annual CO2 emissions ca 10% in 2009 compared to 2004. The development of renewable energy and efficient energy use marks "a new era of energy exploration" in the United States, according to President Barack Obama. Studies suggest that if there is enough political will it is feasible to supply the total United States with 100% renewable energy by 2050. 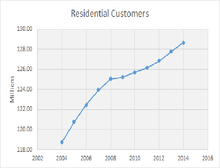 Residential customers (128.68 million) directly consumed 1,407.2 Terawatt hours or 33.93% of the total. This was essentially the same as in 2013. 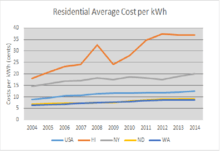 An average residential customer used 911 kWh/ month and with the average US commercial cost of $0.1252/kWh the average monthly electrical bill would be $114.06. Commercial customers (17.85 million) directly consumed 1,352.2 Terawatt hours or 32.61% of the total. This was about the same as in 2013. . An average commercial customer used 6311 kWh/month and with the average US commercial electric cost of $0.1074/kWh the average monthly electrical bill would be $677.84. Transportation customers (79) directly consumed 7.76 Terawatt hours or 0.19% of the total. This was the same as in 2013. System loss throughout the total electrical grid infrastructure by direct use of the suppliers (139 TWh) and for transmission and other system losses and for unaccounted for loads (244 TWh) amounts to 387.9 TWh or 9.21% of the total which is down 0.2% from 2013. Thus, one could say that the US electric distribution system is 90.79% efficient and efficiency has improved over the last year. 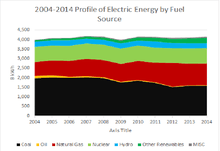 A profile of the electric energy consumption  for 2014 is shown in the following graph. Deviations from the monthly average of 345.52 G Kwhs for each month is shown. The April minimum of 302.02 G Kwhs to the July peak of 390.17 G Kwhs shows the range of consumption variations. 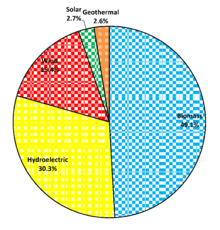 The following table derived from data mined from Electric Power Annual . identifies those states which must import electrical energy from neighboring states to meet their consumption needs. 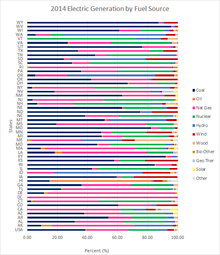 Each state's total electric generation for 2014 is compared with the states consumption and its share of the system loss and the difference between the generated electric energy and its total consumption (including its share of the system loss) is the amount of energy it imports. For Hawaii (HI) total consumption equals generated energy. 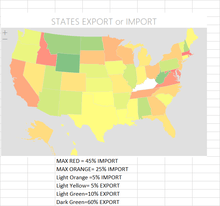 For the other states, multiplying their direct consumption by 1.101562245 (4136613879/3755224815), results in USA supply (including net imports) being equal to USA total consumption. The following chart provides the details. Two graphics showing each states situation with respect to electric energy consumption and generation provide the visual recognition. States Not Generating Enough Electric Energy (MWh) to Meet Their Consumption in 2014. 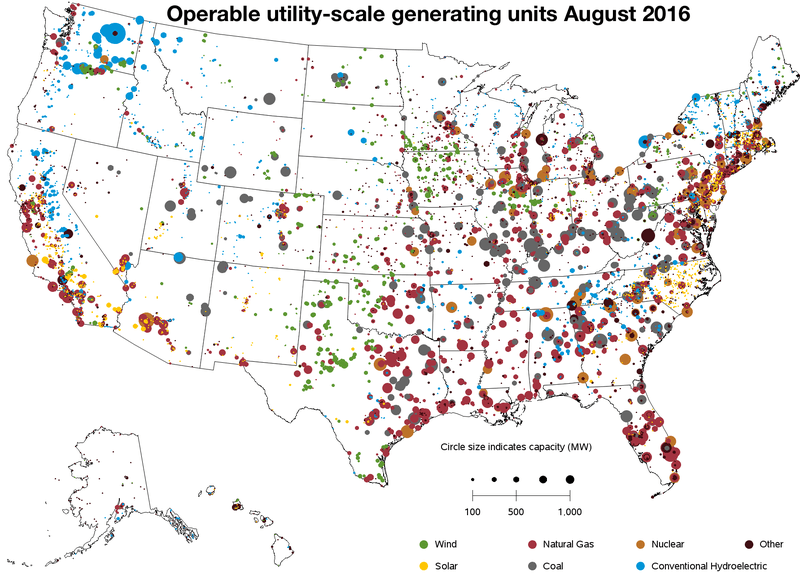 United States 1,068.4 Gigawatt power infrastructure  produced 4,093.6 Billion kWhs (B kWhs) in 2014. USA imports  minus exports was 53.2 B kWhs for a total of 4,146.8 B kWh of electrical energy for U.S. use. Electrical energy generated from Coal was 1,581.71 B kWhs (38.14%); Natural and other Gases, 1,138.63 B kWhs (27.46%); Nuclear, 797.17 B kWhs (19.22%); Hydro, 259.37 B kWhs (6.25%); Renewables (other than Hydro), 279.21 B kWhs (6.74%); Imports less exports, 53.2 B kWh (1.3%); Petroleum, 30.23 B kWhs (0.7%); and Misc (including pumped storage) 6.29 B kWhs (0.1%). United States' renewable fuels (Hydro reported separately) are Wind, 181.66 B kWhs (4.38%); Wood, 42.34 B kWh (1.02%); other Biomass, 21.65 B kWhs (0.52% ); Geothermal, 15.88 B kWhs (0.38%) and Solar, 17.69 B kWhs (0.43%). 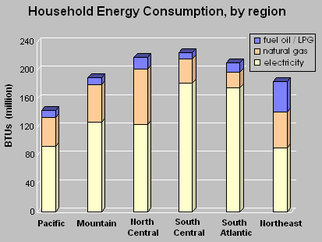 The following tables summarize the electrical energy generated by fuel source for the United States. Data from Electric Power Annual 2014 was used throughout this section. The following provides yearly summaries of electrical energy generation by fuel source. Yearly Electric Energy (B kWh (or Twh) per year) by Fuel Source:. 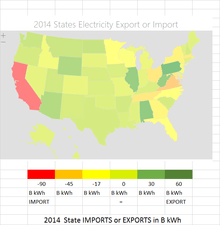 2015 data is from Electric Power Monthly and does not include import-export data. Using the data from the US DOE Energy Information Administration/Electric Power Annual 2014 files Data was obtained from the most recent DOE Energy Information Agency (EIA) full year files. The following table derived from data mined from Electric Power Annual . identifies those states which generate more electrical energy than they need to meet their consumption needs. They supply those that need additional energy. Each states total electric generation for 2014 is compared with the states consumption and its share of the system loses and the difference between the generated electric energy and its total consumption (including its share of the system loses) is the amount of energy it exports. For Hawaii (HI), total consumption equals generated energy. For the other states multiplying their direct consumption by 1.101562245 (4136613879/3755224815) results in USA supply (including net imports) being equal to USA total consumption usage. 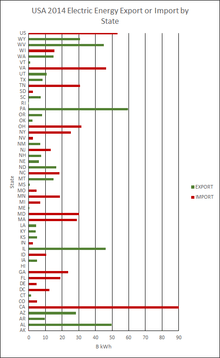 State export is determined by subtracting the state's total consumption from its generation. 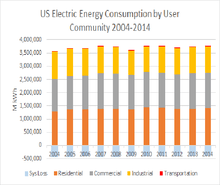 In 2014 USA's electrical energy usage was 4.11% more than in 2004. It was 1% less than the peak in 2007. It was 0.6% more than in 2013. Per capita consumption has decreased about 6.4% since its peak in 2007 and every year since has shown a decrease in individual consumption. Conservation efforts are helping. At least, for the next decade, coal, natural gas, and nuclear will remain the top three fuels for electric energy generation in the USA. Coal will continuously decrease its contribution with natural gas increasing its contribution. Nuclear will have some downs (decommissionings) and ups (new online plants) but probably remain about constant. Hydro will maintain. Petroleum will continue to decrease in importance. Wind and solar will continue to grow in importance; their combined generation was 4.87% of US electric generation for 2014 or 4.81% of total US consumption. A concentrating solar array (CSP) with thermal storage has a practical capacity factor of 33%, and could provide power 24 hours a day. Prior to 2012, in six southwestern states (Arizona, California, Colorado, Nevada, New Mexico, and Utah) the US Bureau of Land Management (BLM) owned nearly 98 million acres (an area larger than the state of Montana) that was open to proposals for solar power installations. To streamline consideration of applications, the BLM produced a Programmatic Environmental Impact Statement (PEIS). By the subsequent Record of Decision in October 2012, the BLM withdrew 78 percent of its land from possible solar development, leaving 19 million acres still open to applications for solar installations, an area nearly as large as South Carolina. Of the area left open to solar proposals, the BLM has identified 285 thousand acres in highly favorable areas it calls Solar Energy Zones. In Spain, with natural gas backups, CSP has reached a capacity factor of 66%, with 75% being a theoretical maximum. President Barack Obama and China's President Hu Jintao announced a far-reaching package of measures to strengthen cooperation between the United States and China on clean energy, 17 November 2010. The presidents began by establishing a U.S.-China Clean Energy Research Center to facilitate joint research and development of renewable energy technologies by scientists from both countries. The center will be supported by $150 million in public and private funds over the next five years, split evenly between the partners. Initial research priorities will be developing better energy efficiency by way of things like electric vehicles. ↑ Barr, Robert. "China surpasses US as top energy consumer". Associated Press. Retrieved 16 June 2012. ↑ "World Development Indicators - Google Public Data Explorer". ↑ "Who We Are". American Energy Innovation Council. Retrieved 2015-01-06. ↑ Broder, John M. (2010-06-09). "A Call to Triple U.S. Spending on Energy Research". The New York Times. ↑ Energy Information Administration (August 2005). 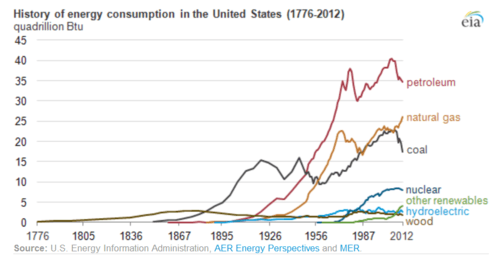 "2004 U. S. Energy Consumption by Energy Source". Retrieved 2007-05-25. ↑ "World Energy Consumption: Map, Figures by Region - Enerdata". ↑ New York City Mayor's Office of Sustainability (2007). "New York City's Climate Change Challenges through 2030" (PDF). Retrieved 2007-02-28. ↑ Danielle Kurtzleben. "The 10 States that Use the Least Energy Per Capita". US News & World Report. ↑ Danielle Kurtzleben. 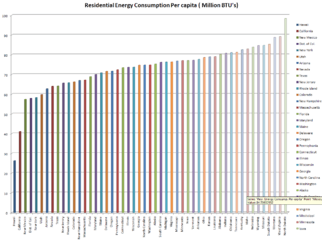 "The 10 States that Use the Most Energy Per Capita". US News & World Report. ↑ Editorial Board (26 April 2014). "The Koch Attack on Solar Energy". New York Times. ↑ Ron Pernick and Clint Wilder (2012). "Clean Tech Nation" (PDF). p. 5. ↑ "Direct Federal Financial Interventions and Subsidies in Energy in Fiscal Year 2013". Energy Information Administration. Retrieved 10 November 2015. ↑ "AWEA 4th quarter 2012 Public Market Report" (PDF). 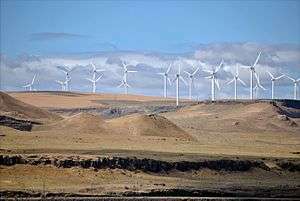 American Wind Energy Association (AWEA). January 2013. Retrieved January 30, 2013. ↑ "Solar Star, Largest PV Power Plant in the World, Now Operational". GreenTechMedia.com. 24 June 2015. ↑ M.Z. Jacobson et al. 2015: 100% clean and renewable wind, water, and sunlight (WWS) all-sector energy roadmaps for the 50 United States. Energy and Environmental Science Issue 8, p. 2093-2117. doi:10.1039/C5EE01283J. ↑ M.Z. Jacobson et al. 2015: Low-cost solution to the grid reliability problem with 100% penetration of intermittent wind, water, and solar for all purposes. Proceedings of the National Academy of Sciences Issue 112, Number 49, p. 15060–15065. doi:10.1073/pnas.1510028112. ↑ "What role have natural resources played in the politics and economy of the Middle East?". Global Connections. Public Broadcasting System (PBS). Retrieved 22 June 2014. 1 2 3 4 5 6 7 Hamilton, James. "Historical Oil Shocks" (PDF). Econweb. University of California, San Diego. Retrieved 22 June 2014. 1 2 Cleveland, Cutler J.; Costanza, Robert; Hall, Charles A. S.; Kaufmann, Robert. 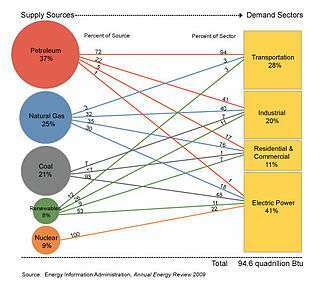 "Energy and the U.S. Economy: A Biophysical Perspective" (PDF). oilcrisis. Science. Retrieved 22 June 2014. 1 2 3 4 Van Doren, Peter. "A Brief History of Energy Regulations" (PDF). downsizinggovernment. CATO Institute. Retrieved 22 June 2014. ↑ "History and Analysis -Crude Oil Prices". ↑ "GAO-05-525SP, Motor Fuels: Understanding the Factors That Influence the Retail Price of Gasoline". 2 May 2005. ↑ Moore, Stephen (2011-10-01). "How North Dakota Became Saudi Arabia: Harold Hamm, discoverer of the Bakken fields of the northern Great Plains, on America's oil future and why OPEC's days are numbered.". Wall Street Journal. Retrieved 2011-10-01. When OPEC was at its peak in the 1990s, the U.S. imported about two-thirds of its oil. Now we import less than half of it, and about 40% of what we do import comes from Mexico and Canada. ↑ Carter, Jimmy (1980-01-23). "Third State of the Union Address". Jimmy Carter Presidential Library. Retrieved 2008-07-27. ↑ Dumbrell, John (1996). American Foreign Policy: Carter to Clinton. MacMillan. p. 81. ISBN 978-0-312-16395-2. Retrieved 2008-07-27. ↑ "United States: Energy". CIA World Factbook 2009. Retrieved 15 June 2012. ↑ retrieved 2012-3-25 Archived May 15, 2012, at the Wayback Machine. 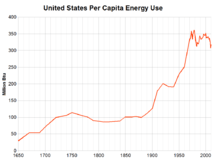 ↑ "Per capita energy consumption has declined in the United States". Knowledge Problem. ↑ Mills, M.P. (1999). The Internet Begins with Coal. Green Earth Society, USA. ↑ "EERE News: United States and China to Cooperate on Clean Energy".